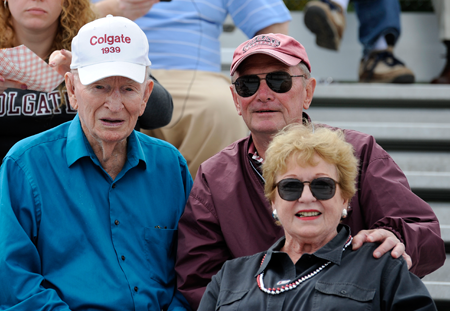 Jim Dickinson ’39, a former Colgate professor and administrator, was back in the stands supporting the Raiders in mid-September — approximately 82 years since attending his first football game. 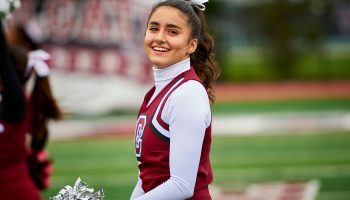 The 95-year-old resident of York, Maine, was a special guest at the Colgate vs. University of New Hampshire (UNH) contest in Durham, N.H.
Dickinson remembered back to his days as a Colgate student when football games were played on Whitnall Field. 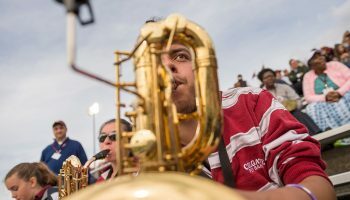 Dickinson’s son, Craig, drove his father to the game and said that, despite the outcome on the field (Colgate fell to UNH, 53-23), the afternoon was otherwise a huge success. The Dickinsons were hosted by athletics director Vicky Chun ’91, MA’94 and football administrative assistant Debbie Rhyde. Jim, who was a Colgate French and Spanish professor, alumni secretary, and the university’s first administrative vice president, still serves as class editor for the 1939 column in the Colgate Scene. 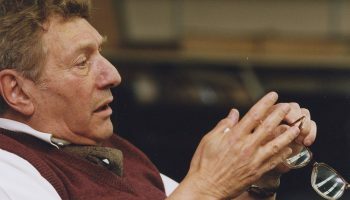 While working in the Colgate Alumni Office in the 1950s, he frequently traveled with former football head coach Andy Kerr to visit alumni groups. 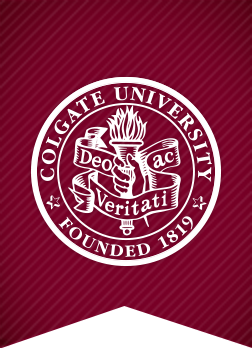 He organized eight reunions at Colgate between 1946 and 1953, including Reunion 1946, which welcomed back the 50-year Class of ’96 — as in 1896!